Portuguese bonds look set to extend their peer-beating performance into 2019, after providing investors with the best returns among peripheral euro-area debt markets last year. 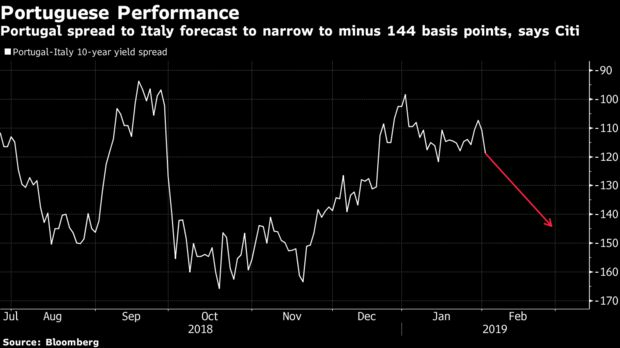 In January, the nation’s bonds gave investors 1.4 percent, according to a Bloomberg Barclays Euro Aggregate Index, ahead of Italy and just behind Spain’s 1.5 percent. This comes after beating both countries with a 3 percent gain in 2018. “Portugal could outperform further versus Italy in the coming weeks,” said Jamie Searle, a fixed-income strategist at Citigroup Inc. He cited a supportive issuance outlook, reinvestment of maturing debt by the European Central Bank and the prospects for further upgrades from rating companies. Citigroup recommended investors buy Portugal’s 2.125 percent bond due October 2028 and sell Italy’s 2.8 percent bond maturing in December 2028. That is to target the yield spread between the two nations’ debt at minus 144 basis points, from around minus 124 basis points on Friday.